Bullion stitch looks very decorative and attractive, but certainly requires a lot of practice. It can be used like an edging or for crocheting very decorative elements and flowers. Using this stitch, you can create a crocheted fabric which structure looks very unusual for the crochet work. No wonder free form artists like it so much! Roll stitch is another a well-known name for this stitch. It is formed by wrapping the yarn a few times around the hook, and than pulling the yarn through all those wraps together. These is where all those troubles come from. Most likely you won't be able to make it look great from the beginning, but as usual, it will get better with practice. It can be done both around the circle and in the row. (See the pictures below). Here are a few practical tips, to make your learning curve easier. Let analyze what should be done, to make your bullion stitch work. For the first step, you form a "coil" around the hook. On the second step, you have to pull the yarn through that coil. yarn does not have to create too much resistance while you pull it through the "coil". The smoother the yarn surface is, the easier you can pull it through the hole. Choose a larger hook which has a flat spot to practice. "Boye" hooks will work pretty well. Wind yarn loosely around the flat (the widest) part of the hook. Make no more than 4-5 turns of yarn around the hook for the beginning. It is crucial for your success: make the wraps loose and even. Let them go through the hook easily. Use a firm, smooth and pretty thick yarn. For instance, Red Heart Worsted Weight. 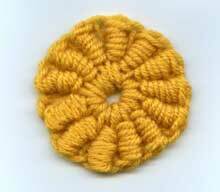 Or even a crochet cotton thread, which has much smoother surface. A soft yarn will make your learning much more difficult as it will catch on the part you're pulling through. It is easier to start practicing making bullion in the row. Once you managed to pull the hook through the loops pretty easy, it is time to try to increase the number of the wraps around the shaft of the hook. Here are slightly different ways of making the stitch. The hardest thing in making this kind of stitches is to pull the hook through the set of loops on the hook. Not every kind of hook and yarn will let you do it easily. Apparently there are the solutions to this problem. Watch these videos. I suspect they will help you a lot to crochet this challenging crochet stitch. Bullion stitches in the circle - Move stitches one at a time. This technique is completely different. You do not have to pull the yarn through all those stubborn wraps on the hook. Move them one at a time. Cover the tip of the hook by a needle. This video is in Russian, but the presentation is very clear. To make the internal diameter of the "coil" bigger, use a big needle. Once all wraps are on place, move the needle to cover the tip of the crochet hook. 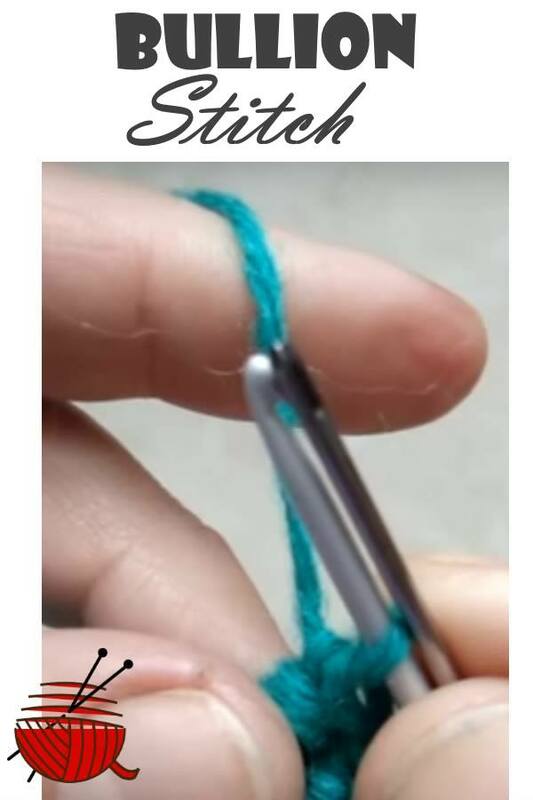 This way you isolate the crochet hook from getting stuck in the "coil".